Its going to be retreating day with not much else on the agenda so my goals are pretty high today. That and without goals I feel like I’m going to be without focus today. 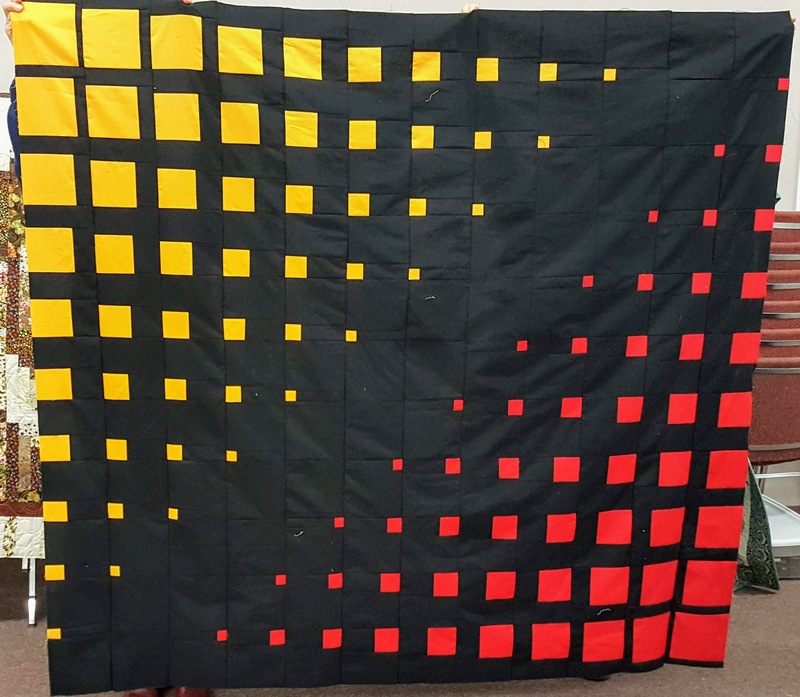 Seems like a lot but none of the quilts are large and so long as I don’t get sidetracked by social media (wish me luck), it should be achievable. If I don’t get there today this gives me a roadmap for projects to tackle this week. Keeping track of my 2019 starts and finishes. 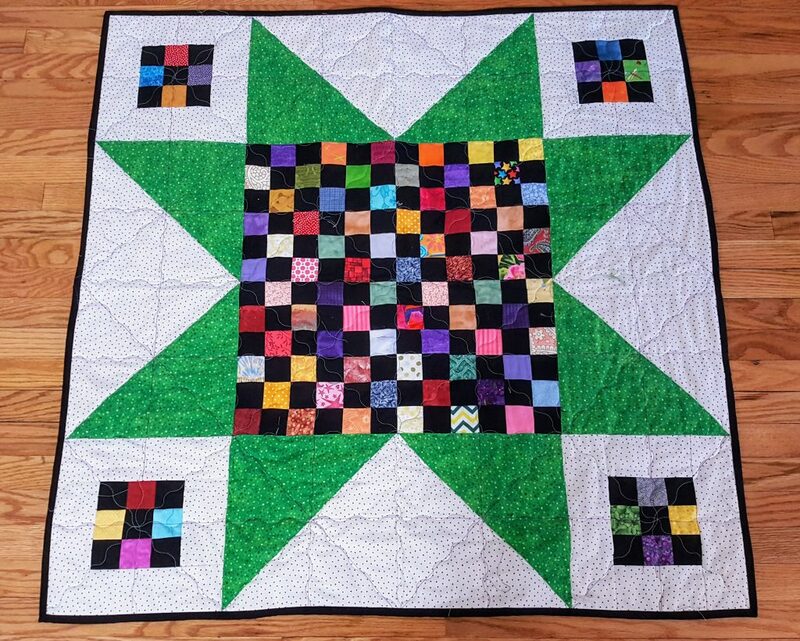 There are also two started 2019 projects – a wheelchair quilt for Dad and a pile of “H” blocks that I’m making to either make into either wheelchair or baby quilts for charity. These will not be going on the 2020 UFO list. My objective for 2019 is to not necessarily get my UFO list to zero, I don’t think that’s realistic but I think what is realistic is to get the list halved going into 2020. If I can do better great, but I don’t want to set myself up for either failure or stress. That defeats the purpose of a hobby that I do for enjoyment. 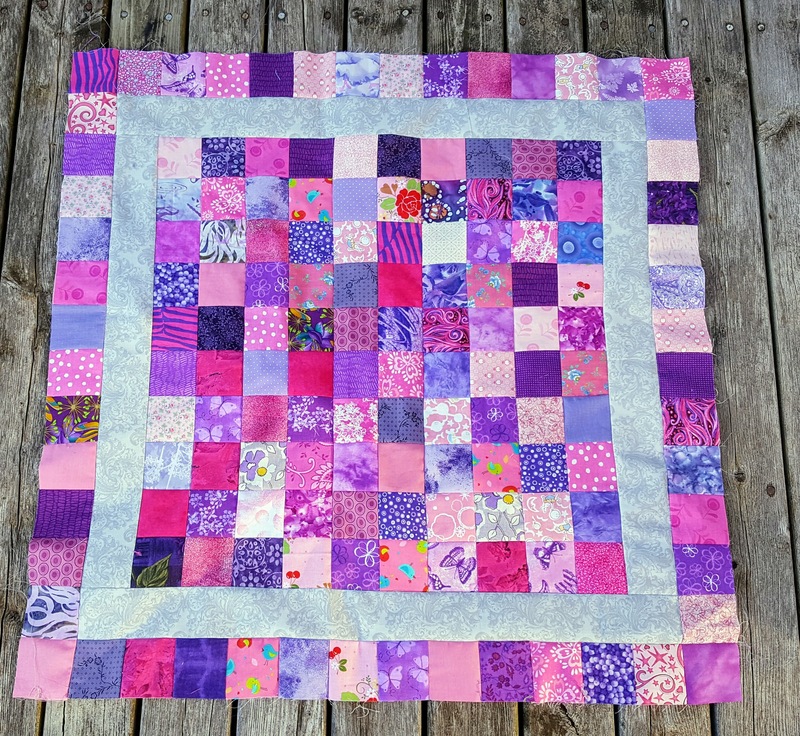 And I’m working on a pink and purple 100-Hugs Quilt for a girl. I haven’t had much time to sew lately so it’s been coming along slowly. No worries whatever I decide. 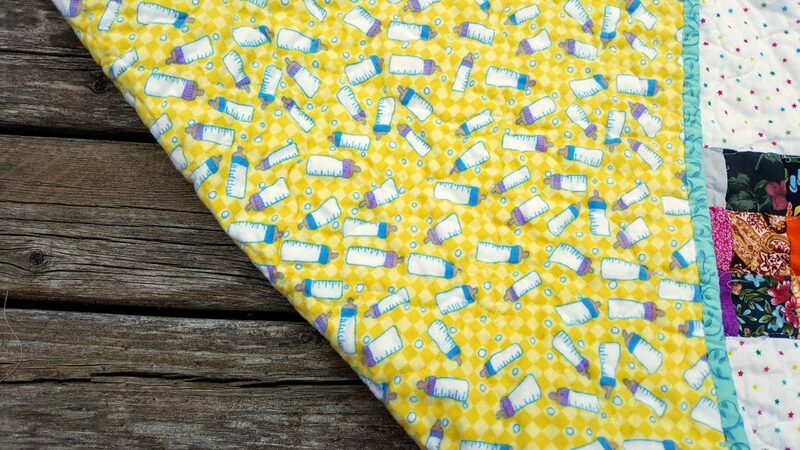 Baby quilts always find a home! 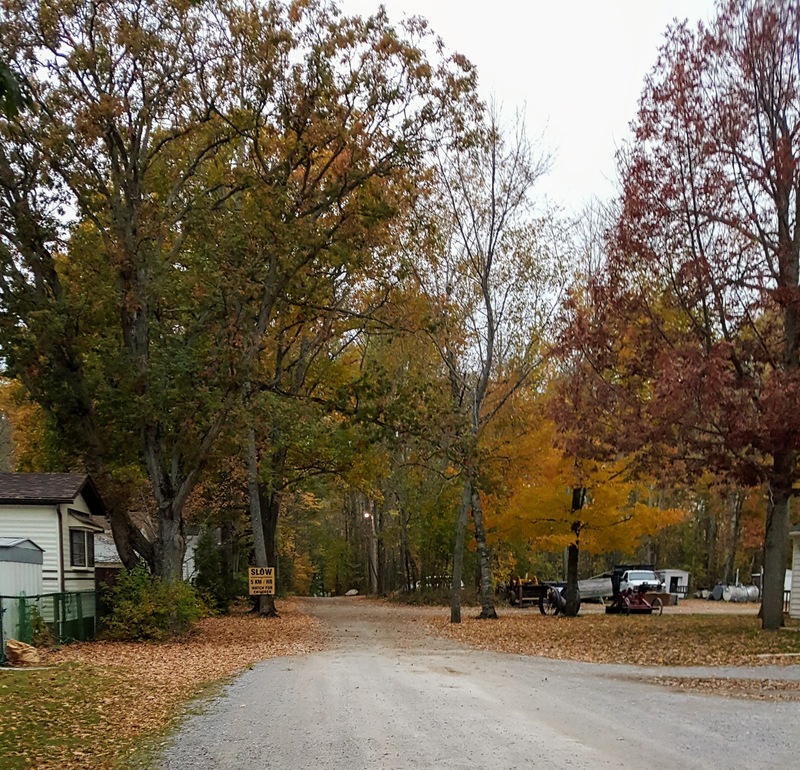 Last weekend I headed to quilt retreat with one of the quilt guilds I belong to. 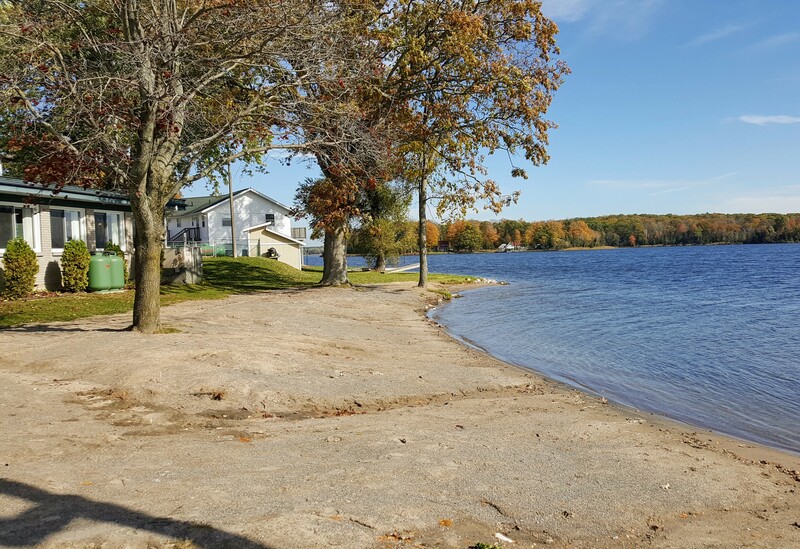 Four days up north of the city in cottage country, with great ladies, my favourite hobby, lots of good food and snacks and wonderful scenery. Just what I needed after a crazy few months of work and life in general. 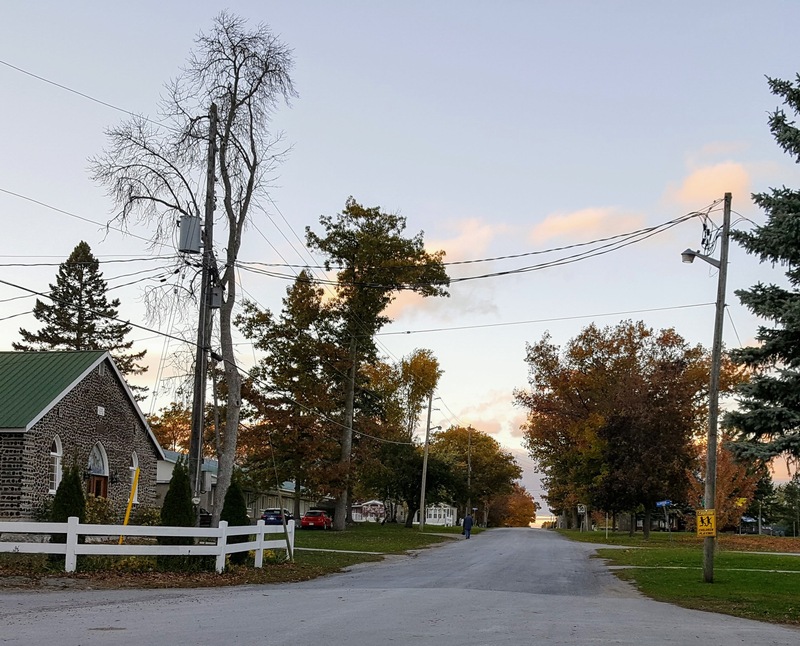 As beautiful as it was it was chilly outside which kept me inside quilting up a storm. It was fun to do but after a while I did need a break from dealing with solid black material with solid black thread. The 132 blocks were easy to put together, however,placement did take a bit of concentration. This too needs outer borders. I just wasn’t in the mood to tackle outer borders at retreat (that and I just didn’t have enough time). I was productive. 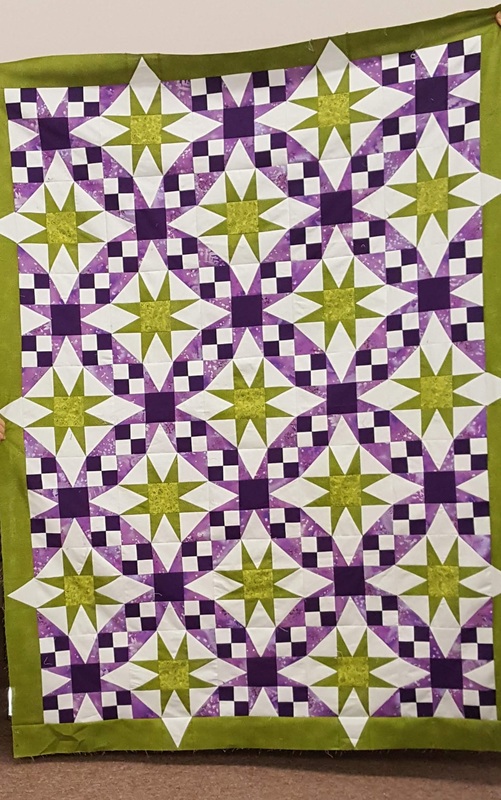 I have another Maple Leaf Strippie cut out that I didn’t get to and I, of course, have to get the borders on the two quilts I started. All very different in style but I liked that as it gave me a very nice variety of things to work on and stopped me from getting bored. 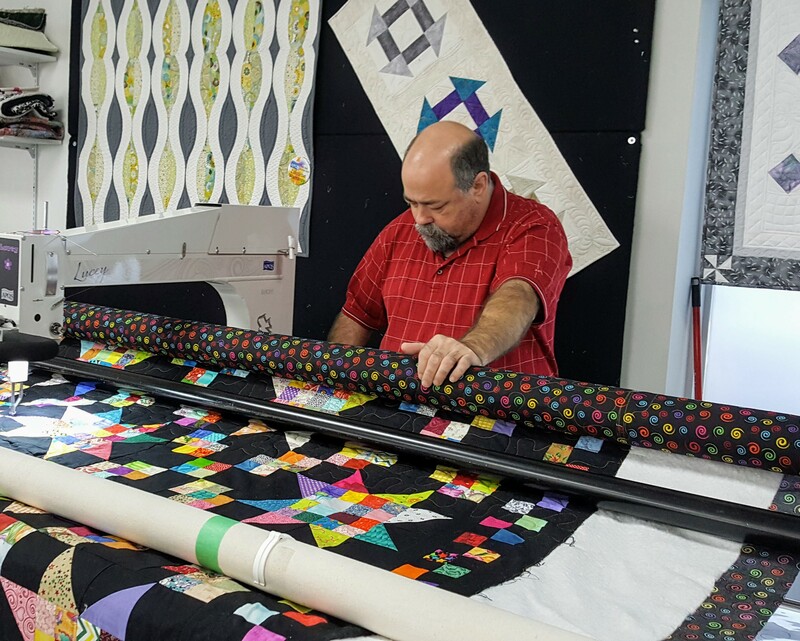 A few weeks ago Marc and I took a course at a local quilt studio, Whirls n Swirls Quilting Studio run by the lovely Tracey, teaching us how to use their APQS long arm quilting machines. Yes, I managed to convince my man to join me in learning to quilt on a a long arm. 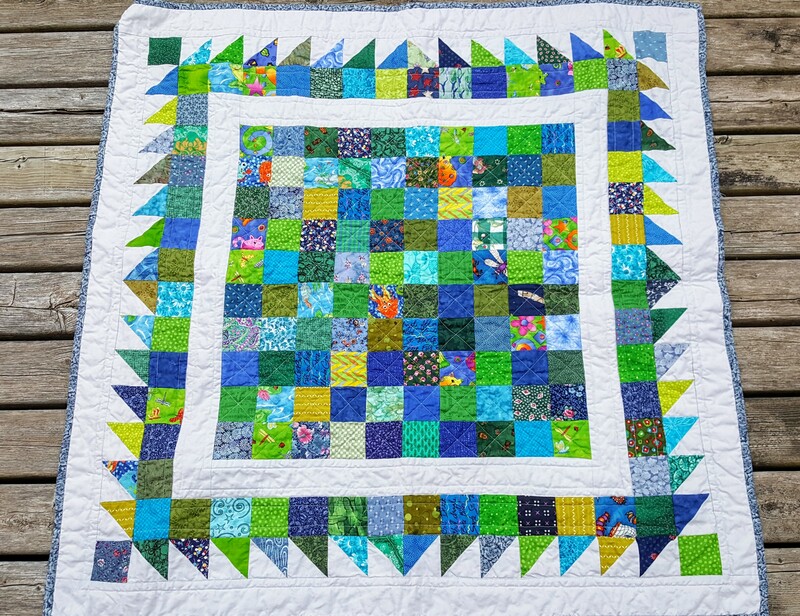 He has tried a bit of piecing and quilting on my domestic machine but it really isn’t his thing yet still he was willing to try this type of quilting – I’m very lucky and I actually think he’s better at the mechanics of operating the long arm than I am. 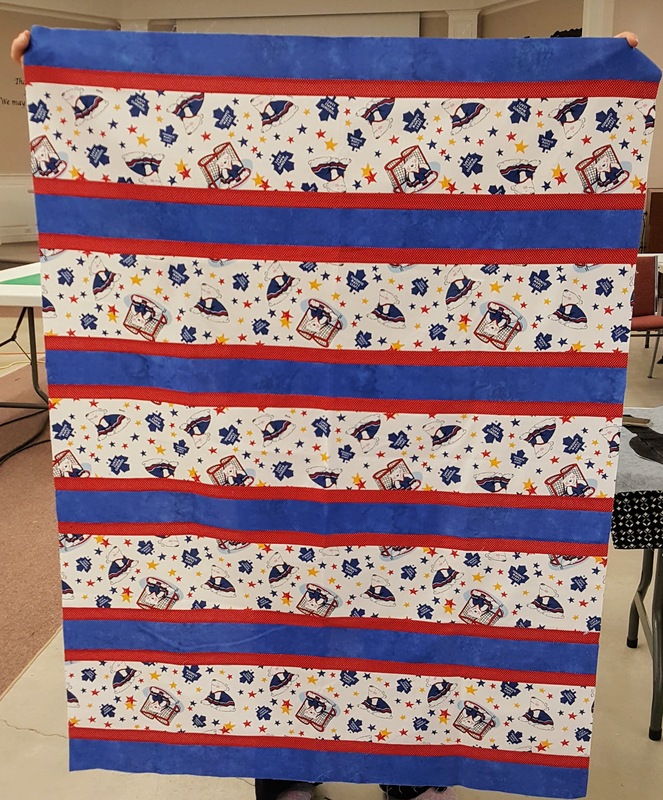 For our lesson we quilted on a quilt panel that they supplied and then donated to a local charity. 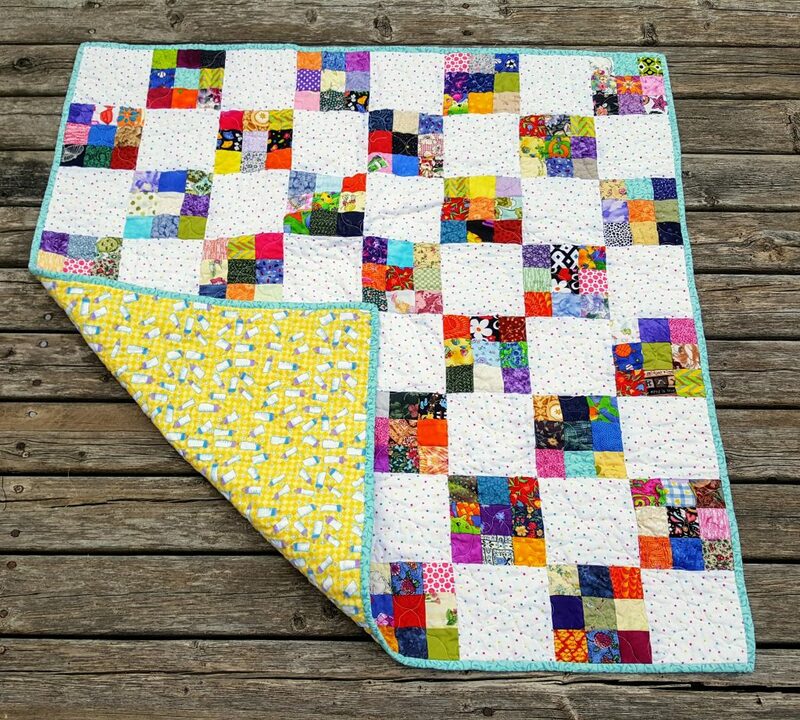 Today we went in to quilt a quilt I had pieced. 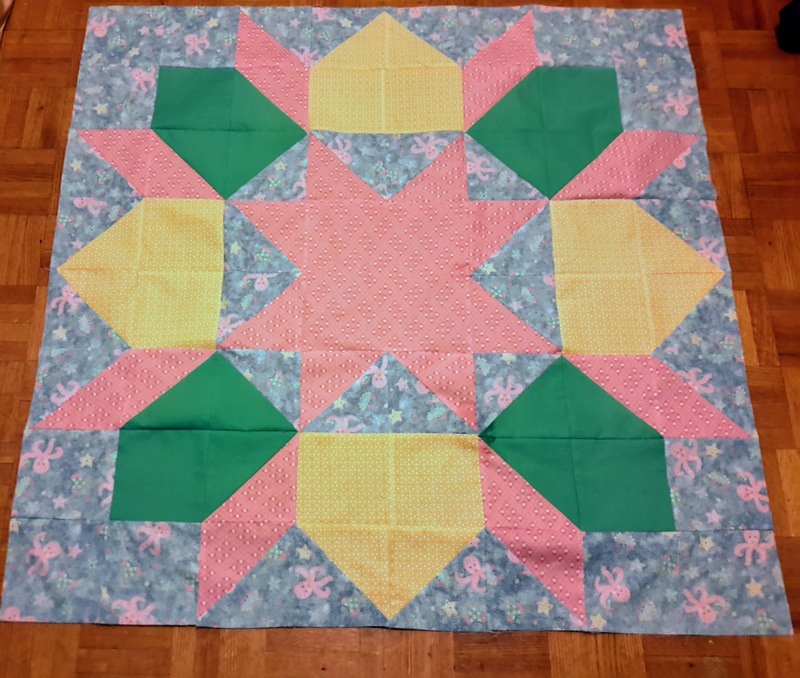 I picked a long finished quilt top from the Wedding Dress Blue blog (I love Deanna’s patterns) called Calico Rose to quilt as my first long armed quilt. Why start with something small when you can start big? Here it is on the machine with Marc quilting away on it. 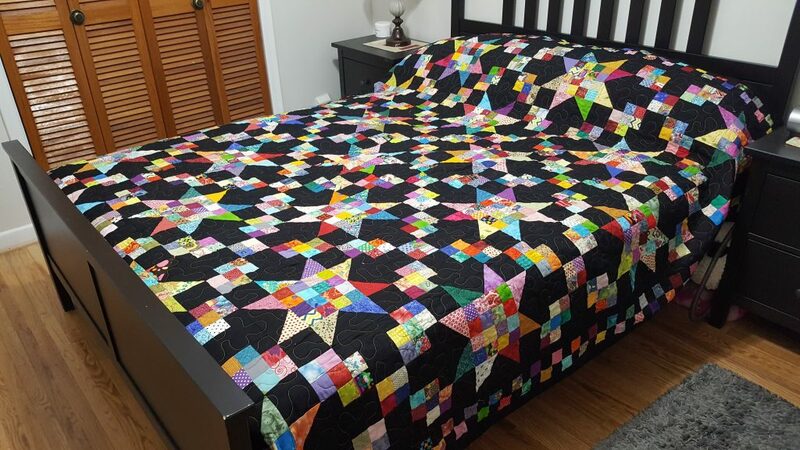 It took us four hours to quilt – a fraction of the time it would have taken me at home. It was also so much easier doing it on the long arm rather than fighting getting it through the the the throat of my home sewing machine. My shoulders, back and arms are loving the decision I made to do this at Tracey’s studio. 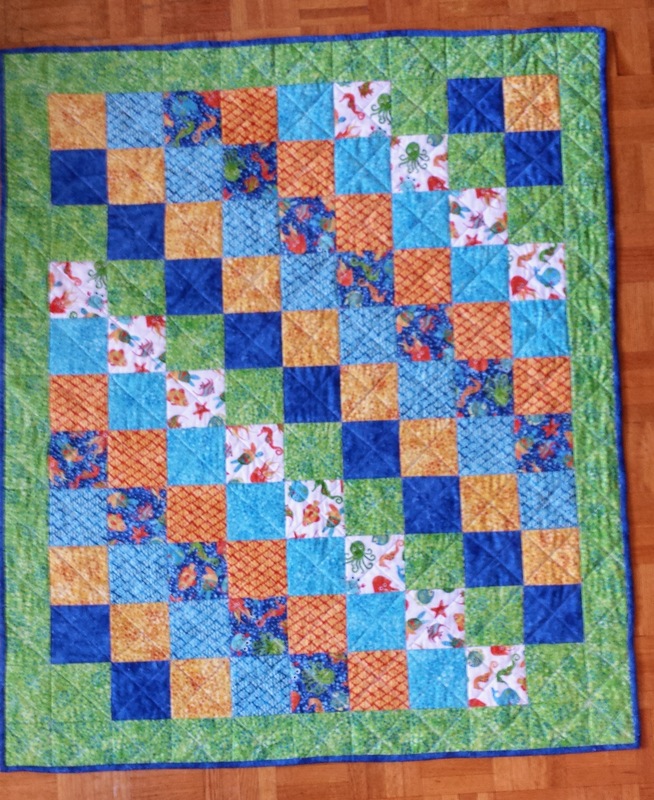 It still needs to be trimmed and binding to be made for it. 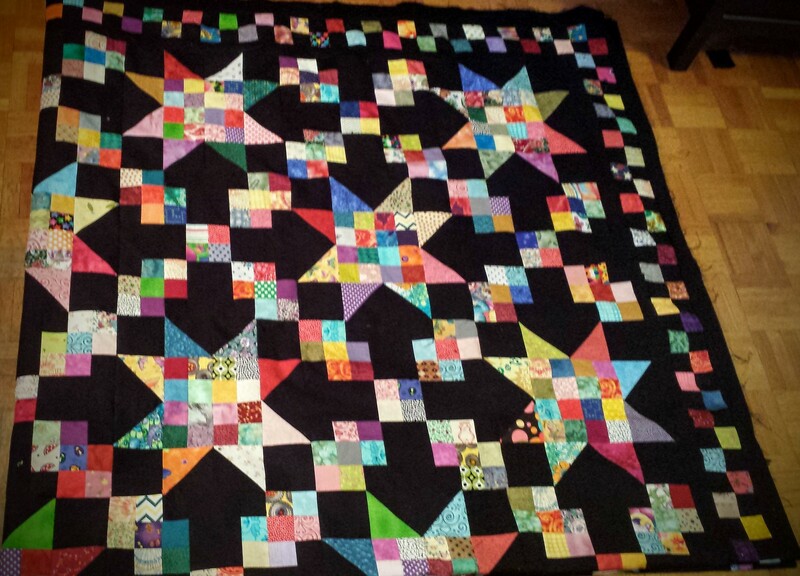 I’m wavering back and forth between solid black binding and scrappy colourful binding. I’ll decide while I get prepared for quilt retreat starting at the end of the week.